Chip's Birthday: It's a Boy! I slept remarkably soundly for the night before an induction, and woke up feeling excited and ready to meet our baby and find out if it was a boy or a girl! I was surprised to feel very little disappointment that I didn’t go into labor in the night - I think at that point I’d just accepted that induction is our reality and I was feeling grateful that at least I was already at 4cm 80% and hopefully could avoid Pitocin. After we got checked in, we settled into our room - which was probably a different room but looked IDENTICAL to the room we had Bettye in (same side of the hall and everything), so that also gave me so much peace.. remembering how beautiful her birth was and the joy and redemption we felt that day. A nurse came in to set my IV and I mentioned that I was planning a natural birth and she said that we’d hit the jackpot on nurses in that case. Apparently our nurse, Elaine, had all of her three kids naturally and taught Lamaze classes for years. She had been a Labor and Delivery nurse for over thirty years. I was so thankful! I’m convinced God placed Elaine there just for us that day - she basically acted as my doula. They started my fluids and I asked, like I did with Bettye, if I could receive half the amount of fluids normally given because I got SO uncomfortably swollen during Amelia’s birth. They agreed to do this during Bettye’s birth, reluctantly, so I was surprised that when I asked this time that they offered to just disconnect the IV altogether! They said they only needed to reconnect it and give me fluids if I ended up with an epidural. I was SO excited! I’ve never labored without being hooked up to an IV pole so I felt like I’d won the lottery! I was so glad I had the courage to advocate for myself and my wishes. Elaine mentioned something about going to get the Pitocin and again I mustered my courage and told her that we had discussed just breaking my water with Dr. Heidemann and seeing if that started labor. I was nervous for Elaine’s reaction, but she was so pleased! She said she loved that idea - and that hopefully we wouldn’t need the Pitocin at all. Again, RELIEF! We were on the same page! She said she’d go wake Dr. Heidemann up to break my water (she was on call all weekend and sleeping at the hospital), so we waited eagerly until she joined us. At 8am, I was still at 4cm 80%, and I guess because of this I didn’t even feel her break my water. It was uncomfortable when we did with Bettye, but this time I just suddenly felt warm liquid everywhere and thought, “Was that it? !” This time, however, my doctor moved the baby around a bunch - which wasn’t painful but awkward and felt like TONS of pressure. 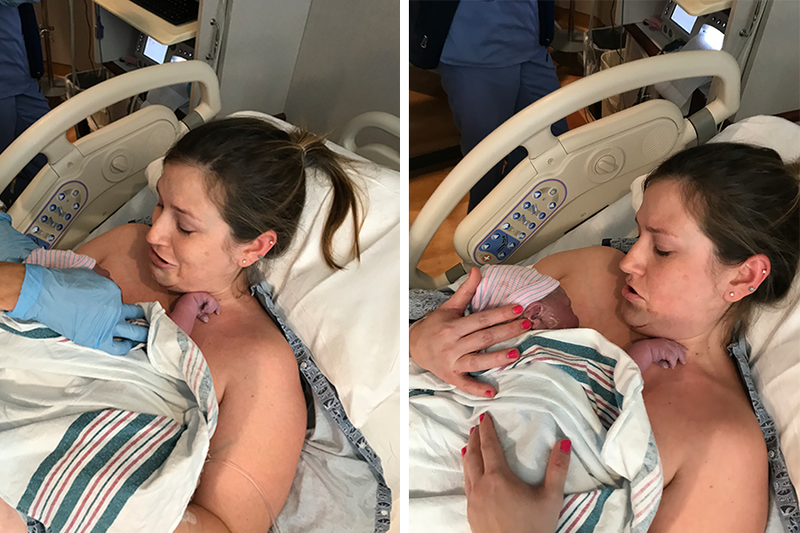 She moved him up and down and back and forth and said she was trying to get out all the fluid she possibly could, because the more we got out, the more likely my body would be to respond. I’d never heard this before but it definitely made sense! After she was done, I asked her how long we would wait to see if I went into labor before starting Pitocin. She said she wanted to see cervical change within 6-8 hours. “SIX TO EIGHT HOURS? !” I thought… I’d almost rather just have Pitocin and have the baby! She said that if a patient called in and said their water had broken at home, she’d tell them to wait 6-8 hours and if contractions hadn’t started yet, to come in… so she was treating me the same. I really appreciated that - she knew how badly I wanted to avoid Pitocin this time - but I also felt a little impatient thinking it could take all day. Bettye’s quick birth had spoiled me! She left and I stood up to go to the bathroom and immediately everything hurt. I kept saying, “Rocks!” to Logan because it felt like I just had a huge pile of rocks in my belly grinding together and against me and it hurt to move even a little. She wasn’t lying when she said she got most of the fluid out - I didn’t feel different at all after we broke my water with Bettye, but we didn’t do any of that moving the baby around business. Almost immediately I started having very strong contractions. I was so relieved! My body was responding! I sat on the bed breathing through them like I did during Bettye’s birth, and laughing with Logan in between. It felt very carefree and we were both in good spirits. At some point during one on my contractions, Elaine saw me closing my eyes and she gently suggested I keep them open to give my brain more stimuli to focus on (besides the pain). Similar to the advice Geraldine gave me during Bettye’s birth about not making noise, this made a lot of sense to me and I used it for most of my labor. After a little while on the bed, I decided to move to the birth ball in hopes the contractions would continue and I’d dilate more quickly. About this time, Elaine came in and with authority told me I needed to start walking the halls. She said my contractions were irregular and varied in intensity, and that’s a tell tale sign that you’re NOT in active labor. She insisted I get up and start walking so they’d hopefully intensify and we could avoid Pitocin. She said, “Walking just makes you feel more human - labor is not a disease state, it helped me a lot in my births.” I was admittedly a bit annoyed because my doctor had given me 6-8 hours and it hadn’t even been two hours. However, I trusted her advice and into the halls we went. We were both in great moods which was such a blessing. The hallway wasn’t long, so I trudged up and down the short corridor in my hospital gown and my fluffy blue slippers and would pause to lean against the wall when a contraction would come. During one of the first contractions, Logan stood there supportively helping me stand and intently watching to see if I needed anything while I breathed through the pain. During the peak of the contraction, his stomach growled so loudly and he put his hand over his stomach as if that would silence the growl. I lost it. I could NOT stop my laughter and it intensified the pain to a level I could barely stand. But I couldn’t stop! Logan tried to be serious to help me pull it together but the growl was SO loud and the fact that I needed desperately to stop laughing made me laugh even harder. Finally the contraction passed and I pulled it together and we kept walking.. but at that point, everything seemed to make me laugh. Logan was so intent on helping me that he insisted on keeping his arm up right beside me - like a rail to grab onto - and I kept telling him I’d tell him if I needed him… he didn’t have to walk like I was going to fall at any moment! It was just making me laugh seeing his arm up like that. He had to walk with his other hand grabbing it, behind his back, to keep from putting it up like a rail for me. It makes me laugh just thinking about it. I kept the laughter to a minimum for a few more lengths of the hallway, but then an incredibly strong contraction hit and as I leaned into the railing in the hallway, my body proximity set off the Purell hand sanitizer station on the wall and again - the laughter just came rushing out. I couldn’t stop it but I also couldn’t handle how painful it made the contraction. I stood there literally banging my head against the wall, laughing and gasping. As soon as I could talk, I said I needed to go sit down… the laughter REALLY intensified things. We quickly walked back to our room and I sat back down on the birth ball. Elaine ran in and said a nurse told her I was crying in the hallway… I smiled and explained that I was not crying, I was in fact laughing hysterically. She was so relieved - she thought her instructions to walk had made me cry! I asked her if the walking had helped - we only did it for about twenty minutes - and she took a look at my contractions and said yes! I was in active labor! All that laughing must have paid off, ha! She could tell I was starting to get in the zone during each contraction, as they were becoming more and more powerful. She suggested I lay on the bed with a peanut ball to rest as much as I could. A peanut ball is sort of like a birth ball, but shaped like a peanut, and it’s especially great for women with epidurals who can’t move around. You can lay with it between your legs and it helps to keep you dilating while laying down. I found it awkward but I was feeling tired and sapped already and welcomed the relief of laying in bed. I put earbuds in and turned on a Hypnobabies track for the only time durig this labor and just focused on relaxing. Just a few minutes passed before I let out a loud moan and raised my hand in the air. I couldn’t speak but I knew this pain. This was what I’d felt right before Bettye was born. Naively thinking, “This is it!” I said, “I need to push!” Elaine ran back in and checked me. I was at 6cm. HA! I felt SO defeated for just a moment.. how could I only be 6cm when I KNOW this is how I felt just before Bettye was born? But I knew things were going to move quickly, based on how I was feeling. I had to get off the bed.. I felt so restless suddenly. She encouraged me that we were close to meeting our baby, and that it’s very common to go from 6-10cm in less than an hour. I did feel encouraged, and I knew I could do it, but I was READY to be done with the pain. I decided to try to use the bathroom, since a full bladder can make contractions more painful. I did the exact same thing at this point in Bettye’s birth - which is so funny looking back because that was the most intense part of her labor (a few minutes before she was born). After I hobbled over to the toilet, I immediately regretted it. I personally find sitting on a toilet incredibly painful during labor. Of course I wasn’t able to use the bathroom, and then I felt stuck there as contractions hit me like waves. I felt sick, so Elaine grabbed a pan to throw up into and Logan stood there encouraging me as I threw up a few times. At this point I knew I had to be close.. I felt stuck. I kept saying, “I want to be done.. I want this to be over..” and I felt panicked about having to endure labor for any longer. I asked to be checked again, but couldn’t bring myself to leave the toilet. Elaine left to get a wheelchair and while she was gone I made a run for it to the bed. Ha - wheelchair abandoned! Once in bed, she checked me again and told me I was at 7cm and beginning transition. At this point I was totally overwhelmed by the pain, and I mentioned that I had some back labor. She moved the bed around to be a chair and pulled a bar out to go in front of me so I could lean forward on it and encourage the baby to turn, if it was in fact posterior - causing back labor. I lost my focus at this point and started breathing erratically and Elaine began some Lamaze exercises to help me bring back my focus. Her exercises weren’t helping me, but I did hear her advice to stop hyperventilating and breathe slow shallow breaths. I focused on a random knot on the wooden floors and tried with all my might to breath shallowly through each contraction. Logan stood beside me reminding me that I could do this, that we were so close. At some point I whispered, “You’re the best.” He was so focused on supporting me however he could - I was just overwhelmed suddenly by his gentle presence and how peaceful seeing him and feeling him next to me made me feel. We rested my head up against the bar and I leaned forward. This was the most comfortable I ever was during that second part of labor. It was a wonderful way to be positioned. Unfortunately, I was leaned so far forward with my huge belly that my left leg started going numb and we had to move me around again after just a couple contractions. I was so sad because I really felt like I’d found my zen in that position and collected myself. Elaine told my doctor at 6cm to head back to the hospital from St. Thomas - she knew it wouldn’t be long. At this point she called her to the room and Dr. Heidemann began setting up all of the birth preparations. I never had this for Bettye because she was born well before my doctor could make it to the room. It was so comforting to see my doctor there, pleasant and calm. She asked if I was comfortable and what could make me more comfortable. Logan at some point began putting ice chips in my mouth and I found this incredibly helpful. It gave my brain something else to focus on, and a place to direct my tension rather than holding it in my body. It was also very refreshing. I had Logan adjust the bed a bit, and I was ready to get this baby out. With that, he slid out of my body and I immediately felt such great relief. I couldn’t believe it! My baby was born! I asked what it was and Logan was looking frantically and hesitantly said, “I … I think it’s a boy?” I replied, “You’re joking! It’s not a boy! Is it really a boy?” He checked again. “It’s a boy! !” “Are you sure?! Are you positive it’s a boy? !” The nurse held my sweet boy up and yes, there was no denying it, he was a boy! I couldn’t stop the tears. They laid him on my chest as we waited to cut the cord and I couldn’t believe I had a son. Laying on my chest. I kept saying his name, Chip, over and over. He was beautiful. Logan cut the cord and as we finished all the other parts of the birth we marveled at our beautiful son and laughed that we both thought it was a girl! But here he was. Charles Archer Hartline, in all his perfect glory. Chip was born at 11:44am - less than 45 minutes after I had asked to be checked with the peanut ball on the bed. He was 7lbs 14oz and 19.75” long. We are absolutely in love, and could not be more thankful for Dr. Heidemann, our nurse, Elaine, and the staff at Centennial for blessing us with the gift of a non-Pitocin natural labor. Logan jokes that Bettye’s birth happened to me and I was an active participant in Chip’s birth. I couldn’t agree more, and I feel so profoundly grateful for getting to experience the birth of my dreams despite having to be induced. As much as I wanted to experience spontaneous labor, I would not have changed Chip’s birth for anything and I have so much peace about that decision. Praise God for a perfect baby boy, and the perfect way to complete our little family. If you need an amazing OB who will listen and take your hopes for your birth into account as things unfold, I cannot recommend Dr. Heidemann (TN Women’s Care) more. We have also had two incredible birth experiences at Centennial - it is an amazing place to have a baby!